After a really long day at work, the last thing that either S, my lovely wife, or I want to do is spend more than a couple hours slaving away in the kitchen making dinner. While we often enjoy spending our weekends prepping ingredients and putting together elaborate meals for friends, most weekdays we simply can’t muster the energy or enthusiasm for anything too difficult. That said, as self-described greedy gourmets, we also want to eat really good, well-made food. Over the years, we’ve enjoyed scouring hundreds of cookbooks for yummy recipes that take no less than 30-40 minutes to prepare. Some books, like Thomas Keller’s French Laundry, have close to none. Some have a few and others, like Nigel Slater’s Real Fast Food, are filled with them. Gary Rhodes’ Keeping It Simple is another such book. S picked up this gorgeous hardback a couple of months ago. It’s a great book for beginner cooks as well as more advanced ones. The former group will love how easy the recipes are to follow. They’re neither too elaborate nor do they call for too many ingredients. They don’t take too long to make and the steps are very clearly explained. The latter group will like this book because the dishes in it are photographed beautifully and sound yummy. Many of these advanced cooks probably won’t need to follow the recipes item by item or step by step. But they will find them inspiring. 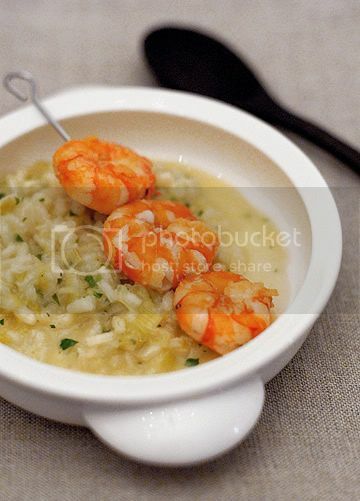 S and I were similarly inspired by Rhodes’ “tiger prawns with a leek and mozzarella risotto”. The combination of freshly grilled prawns and rich, cheesy risotto really appealed to us. After a quick read through his recipe, we started working on fashioning our own version. Instead of grilling the prawns with olive oil, as Rhodes recommends, we pan-fried ours with garlic. Similarly, we tweaked his risotto, substituting white wine with vermouth, replacing the onion with extra leeks, and increasing the amount of mozzarella in it. The dish was a breeze to make. From start to finish, it took no more than 40 minutes. Perfect for an after-work meal. Heat 1 tablespoon butter with 1 tablespoon olive oil in a medium-sized pot. When bubbling, add the julienned leeks and cook over medium heat until soft. Then add the rice and stir, toasting the rice slowly. Then add the vermouth and let the alcohol bubble for a bit, until the alcohol smells burn off. Then lower the heat and add about one to two ladles of chicken stock. Let the stock reduce and then add another ladle or two. Repeat until all the stock has been added to the rice and is reduced. All the stock should be absorbed by the rice. Then add 1 more tablespoon of butter, the mozzarella and the parmesan. Stir and add salt and pepper to taste. Heat 1 tablespoon of olive oil in a frying pan over high heat. Add the garlic and let cook for a little less than minute. Don’t let the garlic burn. Then add the prawns, a pinch or two of salt and sauté for 2-3 minutes or until just cooked. When serving, add the parsley to the risotto and spoon into a shallow bowl or plate. Place the garlic prawns over the risotto and enjoy. Yum! This dish looks delightful…I bet it would also be good substituting green garlic for the leeks. Thanks for the recipe. Great recipe, thanks. Looks like a delicious dinner with minimal prep time. My favorite kind of dinner. Weekends are another story, but weeknights I just want quick and tasty. Thanks for another idea. More posts like this please. What you wrote about you and S liking good food but wanting it not to take all day strikes a chord! Yum yum! This recipe sounds and looks delicious. I have a weakness for purchasing expensive hardbacks just because its beautiful and the photos are exquisite – i guess that could mean ‘for inspiration’. Like you, i often prefer less elaborate meals but taste so good. Often, long list of ingredients puts me right off. S, CH — now I know what to do with the prawns that we bought yesterday…thanks for the recipe! I am now officialy dead from severe hunger! Seriously, this looks so so good and the picture is stunning. errr… the rice to me looks awful. You should make them dry like maybe stir fried rice? Nosheteria: Sounds like a good idea. Mae: I agree. I have a ton of books that I have yet to cook from and which I bought just because they’re beautiful. Cath: Hope the dinner was good. Jessie: It’s risotto. If it was dry, I would have ruined it. Risotto is also one of my favourite dishes to make when the brain is too exhausted and dead beat from work. My arms are on “auto pilot” and all there is to do is stirring with the right hand and wine glass in the left. mozzarella? really? I don’t know why that surprises me to go with shrimp but it sounds great. hello! would like to ask for your help! where in singapore can i buy arborio rice? i have trouble finding it! would appreciate your help! thanks! Hi, most Cold Storages would have it. Culina definitely would have it. I am pretty sure Marketplace carries it also. Good luck. Thanks for posting this, I attempted cooking proper food for the first time with this recipe and I fretted the entire way through that something would go wrong but it turned out more than decent. Lovely blog you’ve got, keep the entries coming !